Full 1 Bedroom, 1 Bathroom, Sleeps 2-4, 775 Sq Ft. NOT a small Studio unit. My condo, Unit 4611A is located in the Bison building at The Lodge at Westgate Park City, at the heart of the Canyons Resort in Park City, Utah. All photos on this ad are of my actual unit, not stock photos. The minimum number of required consecutive rental nights varies through the season. Please contact us to confirm availability and number of required nights. Architecturally, Westgate blends with the signature look of the village. Setting the tone for a relaxing luxury vacation experience, the resort includes the 30,000 square foot world class Serenity Spa, with an indoor groto and waterfall. In addition to the Serenity Spa, Westgate's fitness amenities include a fitness center for both resistance and cardio training as well as a private yoga room. There are also tennis courts, basketball courts, and a business center which are all Westgate Lodge amenities. The Kids Club is onsite with daily activities, playground and a professional staff for the little ones. For food and groceries inside Westgate, there is the Marketplace Deli for convenience store style shopping as well as two restaurants, Drafts Sports Bar and the Edge Steakhouse. Be sure to try Drafts for casual dining and Edge Steakhouse for fine dining. Need rental equipment? Aloha Sports is located inside the Westgate and skier services works closely with them to make returning of your equipment at the end of your stay seamless. Once you arrive at Westgate you will check in with the professional front desk staff who will greet and assist you. A 24 hour Concierge is onsite for all travel, activity and entertainment arrangements. Like every unit in the building, ours has designer furnishings and stunning architectural details. Natural materials, western accents, stainless steel appliances, high def TV and private balcony. Our unit at the Westgate Resort also has breathtaking valley views to be enjoyed any time of the year. Besides the quality of the rooms our favorite part of the resort is the SERVICE. Store all of your ski equipment at the ski valet for free. Have all of your equipment ready and waiting for you when you are ready to ski in the morning. The valet service delivers it directly to the 'Flight of The Canyons' gondola for free. Done skiing for the day? Give your equipment to the valet service and they will store it. Need your boots dried? They do it for free. Want to ski Deer Valley or start your day at the Park City Mountain Base? The valet service will have your equipment ready for you to go in the morning. The Westgate resort shuttle will deliver you to Deer Valley or Park City Mountain. Done at Deer Valley? Want to shop or eat downtown? Call the shuttle. They will pick you up and drop you off downtown. Then they will deliver your equipment back to the valet where it will be dried and stored and ready for you the next morning for free. Done shopping or eating? Call the shuttle for a ride home. The service just doesn't get any better than this! 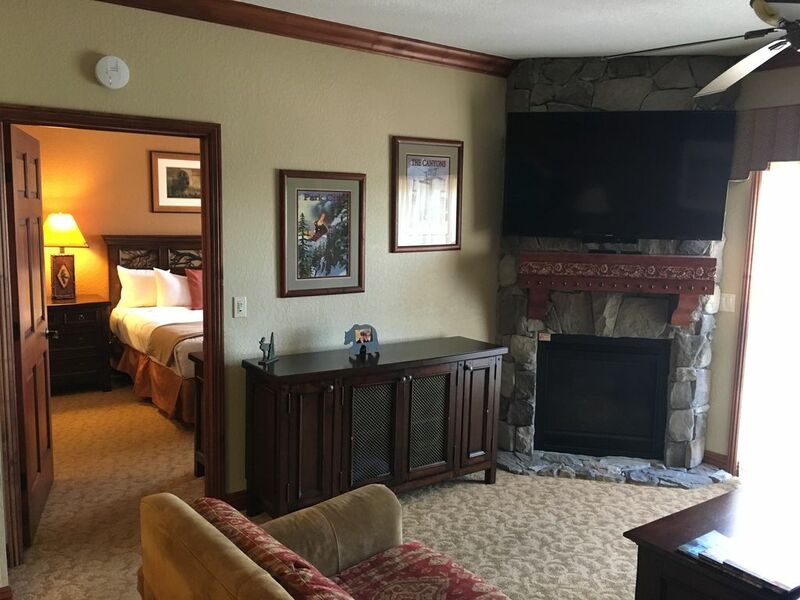 Westgate Lodge and Westgate Park City Resort and Spa stand as one of the highest quality condominium and timeshare projects in the Western United States and is designed with Five Star service, finishes and amenities in mind. My name is Louis Sclafani and I own this condo at the Westgate Lodge in Park City. My career was as a District Chief with the Pinellas Park Fire Department in Florida but my hobby is vacation rentals. I have been renting my unit here since I first owned a timeshare in 2002 and then upgraded to a full condo in 2008. I also travel and ski with the Clearwater/St. Pete Ski Club. As a result I have plenty of experience renting my unit here, renting units for myself and my club elsewhere. My goal is to make your rental experience simple and smooth and your stay enjoyable and comfortable. I have skied many mountains and resorts with my ski club but when you put everything together, I think Park City has it all. With three resort bases side by side giving you over 10,000 acres of terrain you have plenty of ski options. Easy access from the airport. Only 35 minutes of interstate driving from the airport to the condo. Most big name resorts are 2-4 hours or more from their major airport. A real town with real shopping, real nightlife and real non ski activities. And of course the lodging itself. Location, location, location. At the heart of the Canyons village it doesn't get any better. On top of that, all the Westgate amenities offer a level of comfort and convenience that is hard to beat. Every where I go I compare them to this property and rarely do they compare. Few mountain properties offer the convenience of a free PRIVATE shuttle, ski valet, private locker rooms and ski concierge. Modern furnishings, full kitchen, washer/dryer, balcony with a view, multiple pools and hot tubs, on site dining etc. Don't forget. As a Vail Resorts property, your EPIC Pass is good at Park City Mountain Resort & Canyons. Sorry, Deer Valley is not part of the EPIC Package. Granite shower equipped with regular head, rain head and steam head. Push a button and in minutes the room is full of steam! Downtown Park City is only 5 minutes away. Canyons is part of the Vail owned Park City Mountain Resort Ski Complex. Your EPIC Pass works here. All 7300 acres of the combined Canyons and Park City Mountain resort are just out the back door. The Canyons Village is a quant vibrant village with plenty to drink, eat and shop just outside the condo door. The Canyons course runs throughout the area. Part of the course can be seen from the unit balcony. Meet at the bottom by the ski valet. Ski's carried to the gondola by the ski valet. 100 yard walk. Very close but you can't hear it. Flat screen High Def TV's in bedroom and living room. Valley and pool view. Watch the Sunrise from our balcony. Over 7300 acres. It is the largest resort in the United States. Vail Resorts now owns both Canyons and Park City Mountain Resort and they have linked the two by a common lift. EPIC pass works here! Spa, Jacuzzi and Sauna available on site. On site Mountain Golf Course is now open. Disc golf, tubing, mountain biking, snowmobiling. Utah Olympic Park is next door. Ski and bike rentals available on site. Additional housekeeping is optional on a pay per day basis. Lou was great to work with and was super quick to reply to any questions or concerns I had. The view from this condo is impeccable, and the property was fun, quiet, and in a great location. The spa was top-notch and the staff was friendly and helpful all around. We’ll definitely be back. Worked out great for our family. The gondola was a walk down the hallway and then 100 or so yards once outside. The Westgate has pools and hot tubs like other places but also an arcade and ping pong area which our boys enjoyed. We've stayed in Park City for the last 4 years but decided to try the Canyons area this year. The snow was great and we never made it to the Park City side for skiing or dinner finding the restaurants in the Canyons and eating in to be sufficient. We found the condo to the perfect size for a family of 4. This room was perfect for a ski vacation. Very close to the ski lift and restaurants. So glad you enjoyed your stay with us. Hope to have you back again. Great location. Lots of amenities. Convenient shuttle service. Clean and comfortable accommodations. Enjoyed steam room in shower and although didn’t have time to use it, large jacuzzi tub looked amazing. Would definitely stay again. It was. Pleasure having you. Let’s do it again in the future. Everything worked as advertised. Easy to do business with owner. Nicely outfitted and all amenities available. Convenient for skiing vacation. Thanks for the great review. Always appreciate it. Hope to have you back in the future. The Westgate Lodge is one of the best lodging options available at the Canyons. I have a Full 1 bedroom unit (775 Sq Ft) on the 6th floor of the Bison Lodge at Westgate. This is NOT one of the small studio units. Park City Mountain Resort and Canyons Resort were previously two different resorts. Today they are owned and or managed by Vail Resorts and Vail has now combined them for the largest single ski resort in the United States, over 7300 acres. Canyons is now considered a village base area for the combined resort with its own lodging, dining and shopping. Westgate is in the heart of The Canyons Village and less than 100 yards from the main gondola called "Flight of The Canyons Gondola." 50 more yards away is the Orange Bubble Express. This is a heated covered (Orange colored plastic lens) quad lift taking you up to Lookout Peak. From here you can start skiing on the far right of the resort and work your way all the way to the left. You can then either ski your way back or call Westgate's private shuttle to pick you up. Vail has invested heavily at Canyons in it's snowmaking capability for that early and late season ski experience. How much more? More than double the previous capacity. Other Activities in the area include: Snowmobiling, cross country skiing, shopping, snowboarding, wildlife viewing, rock climbing, basketball, and hot air ballooning. Utah Olympic Park is less than 5 minutes away. Here you can tour the Olympic museum, ride a real bob sled, zip line, or even practice your aerial flips into their practice pool. Come see budding future Olympians train in this world class venue. Different times of the year have different minimum night stays. Please contact me to confirm minimum # of nights required for our stay. Reservation number will be provided after down payment is received. Additional housekeeping is available on an as need basis. Please inquire about cost and availability.